"First rule of singing, get the rafters ringing..." Well, there can be no doubt at all that the cast of Sister Act had the roof of the King's Theatre rattling and the audience dancing through the encore of Raise Your Voice. The Glasgow audience lapped up every second of the show and leapt to their feet during the curtain call. The Hampden Roar is famous in football and certainly the King's Theatre Roar must be the loudest in all the theatres in Britain. I've never heard such loud appreciation from an audience. Alan Menken's joyful music and Glenn Slater's clever lyrics put the soul in this stage musical based on the film of the same name. The musical is set in 70s Philadelphia with the same characters and a similar plot to the film but with new original music and lyrics different to those used in the famous film. Paying attention to the lyrics is a must in this show as some of its cleverest comic lines are wrapped in the song lyrics. Cynthia Erivo is a remarkable leading lady and confidently heads the cast as the tour de force that is the strong-willed Deloris Van Cartier. Her voice alone could make the rafters ring with its soulfulness and power. She captures the essence of Deloris beautifully and her rebellious streak shines in the scenes where she is juxtaposed with Mother Superior, played by Denise Black. Black is brilliant as the increasingly exasperated and overwrought Mother Superior. Her character choices coupled with the fact that the Mother Superior undoubtedly has some of the funniest one-liners bring real humility to a role that could easily come across as cold in the wrong hands. Where Sister Act really comes into a league of its own are the ensemble choir pieces. This show and its stellar cast are a perfect reminder that some of the best voices you can find in the UK belong to musical theatre performers, they are incredible. Stuff the X Factor I'll take the Nun Factor. This cast could knock any of the X Factor contestants into a cocked hat on any day of the week. The range and power of their voices ensures the soaring harmonies come alive and when Sister Mary Robert, played by the extremely talented Julie Atherton, breaks into her solo during Raise Your Voice she deservedly got an immediate roar of surprised appreciation from the audience. Although the "Sisters" are the focus of the show, male cast members Edward Baruwa and Cavin Cornwall are scene-stealing as the hapless Eddie Souther and villain of the piece Curtis Jackson. Their rich voices are showcased beautifully in their solo pieces I Could Be That Guy & When I Find My Baby. Curtis's henchmen are the comedic triple act of Gavin Alex, Daniel Stockton and Tyrone Huntley who had the audience in fits of laughter during their masterful performance of Lady in the Long Black Dress. 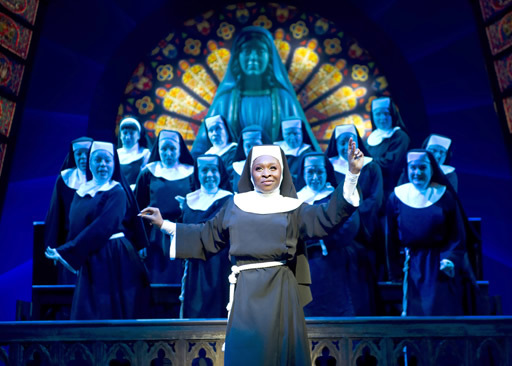 Sister Act is a joyful show with a glittering finale that will deservedly sell out theatres during its tour. Head on down to the King's Theatre to join the choir while you can, it's the happiest night out in town.